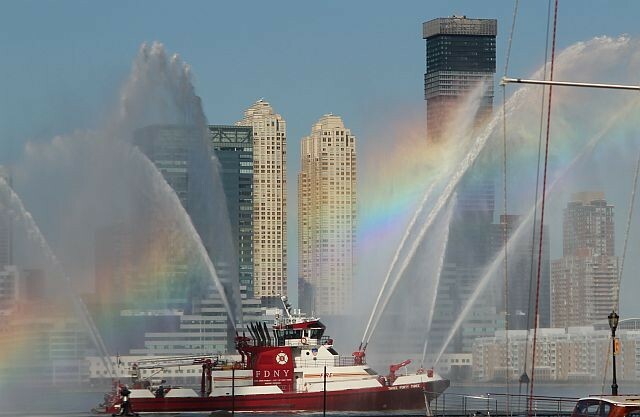 FDNY fireboat 343 displaying her ability to flow 50,000 gallons per minute at the 17th annual Steve Siller Tunnel to Towers (T2T) memorial run on 9-30-2018. Notice the rainbow mixed in with the streams. At the tunnel's exit in Manhattan the runners are greeted with members of FDNY showing larger-than-life photos of the brothers lost that day and cadets from the US Military Academy at West Point holding American flags. One photo shows a firefighter emulating Siller by running in full turnout gear. Many of the runners do this. This year more than 50k people participated. I had the honour and pleasure of a guided tour of this impressive vessel just this last Friday while with a friend who is a FDNY dispatcher. Certainly not like anything we have in the UK anymore, where fireboats are now rare. Added by Andy Fish on 09 October 2018.